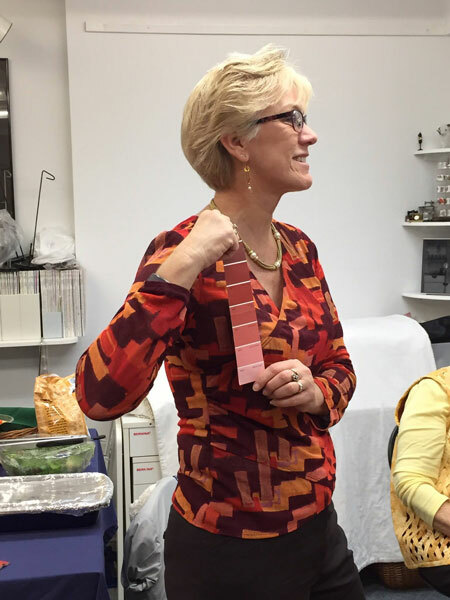 Jane had students blindly choose a paint strip which had one color family on it and 7 different values. 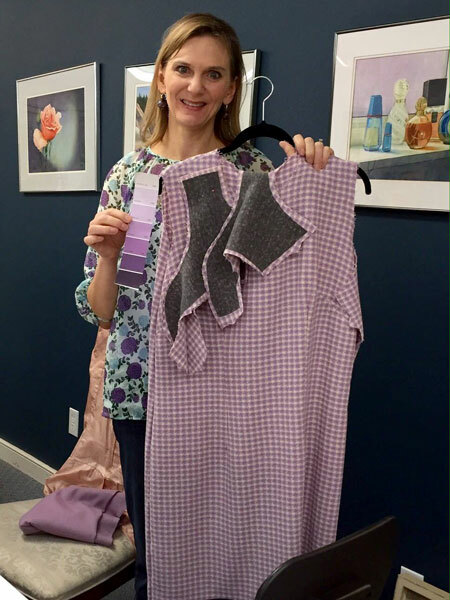 The challenge was to use at least three of these color values and create anything they wanted as long as fabric was included in the project. Only the colors on the paint strip could be used. This was an exercise in accurate color matching and "making them all work together". Everyone had fun with this challenge. 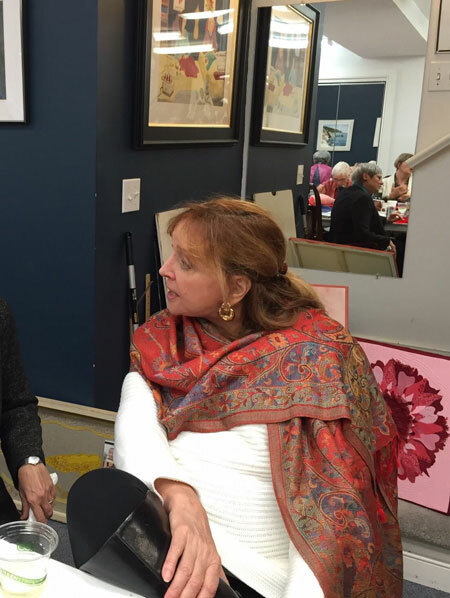 Everyone met in Jane's studio for a potluck and to share their creations. 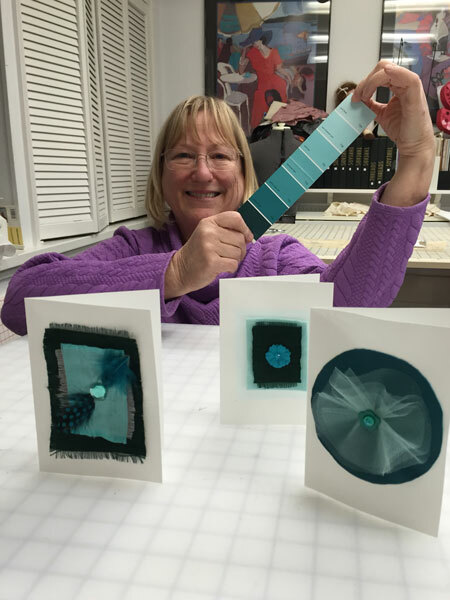 Many of the photos below show the color strip each person was using. 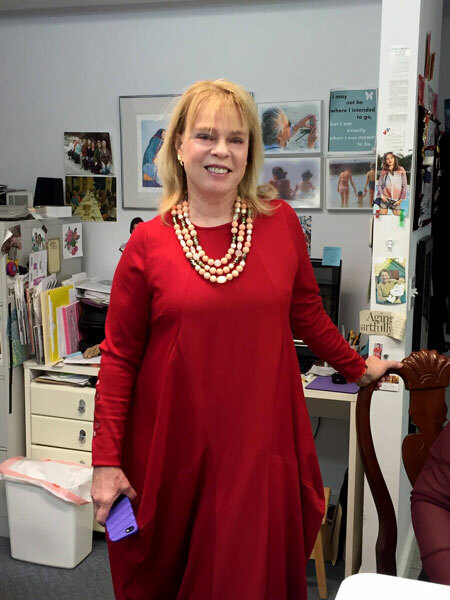 Ellen made this lovely knit dress and machine embroidered a design on the sleeves. 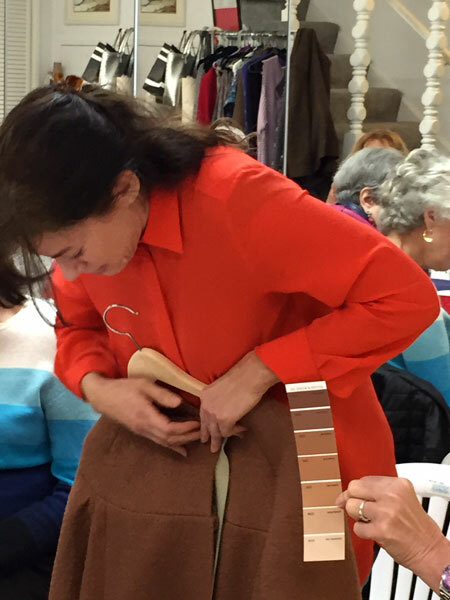 Jean is making a lined coat with wool and faux leather to match her color strip exactly! Katherine is making this wool dress. 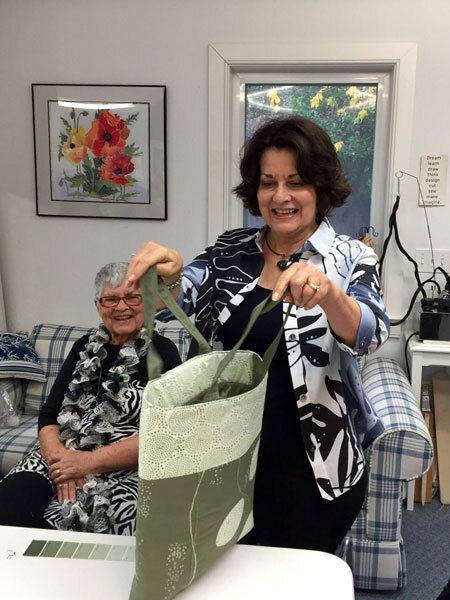 Santina made a reversible tote bag and screened the design with paint from her husbands Benjamin Moore paint store! 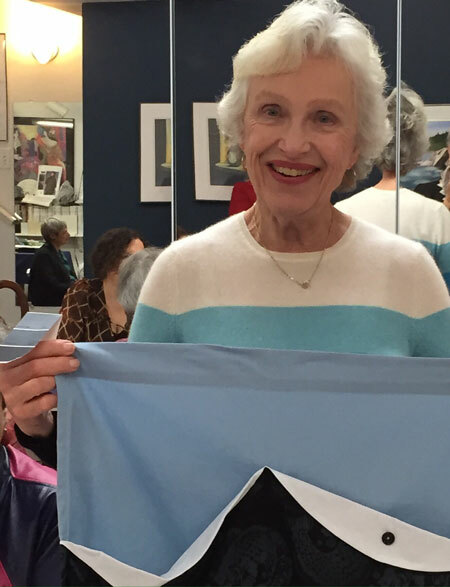 Barbara machine embroidered a lined purse with the colors she was given. 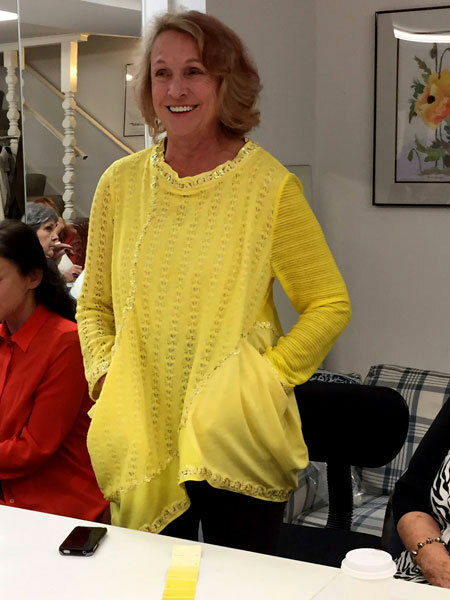 Diana had this yellow knit in her stash and used it for her project. She bought the trim at Britex. 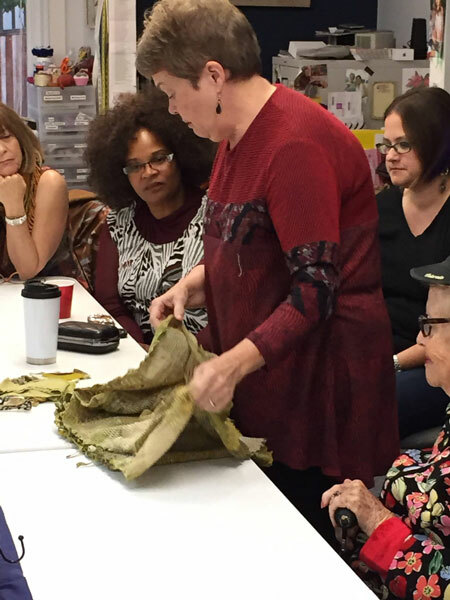 Betty finished a vest that she started many years ago! She lined the back and screened a design on it. 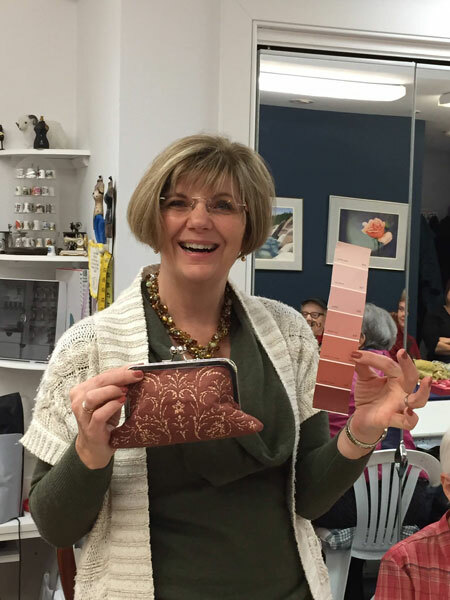 Kathleen wove, on a loom, this amazing length of cloth with strips of fabric the same colors as her color paint strip. She may leave it as a wrap or make a vest out of it! 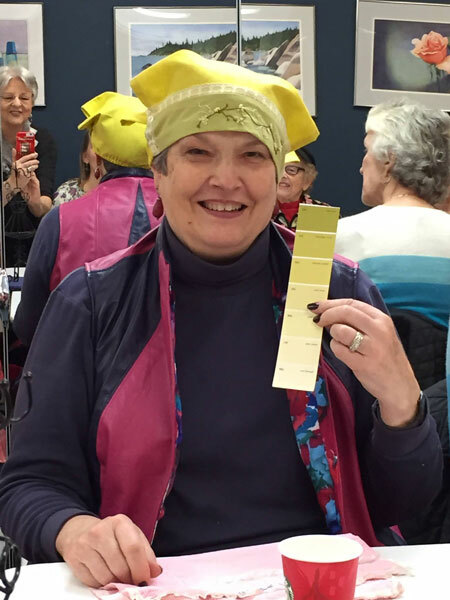 Kathryn made a head covering to replace the one her mother made her when she was a child. She will wear it when she is gardening to keep the bugs off! 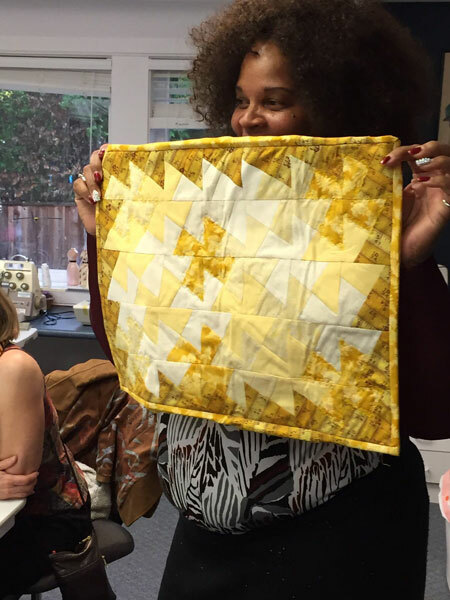 Susie pieced a table topper with her yellow hues! Lark dyed her fabrics the colors she needed to get the bright greens. She made a knit top and a bra...amazing! 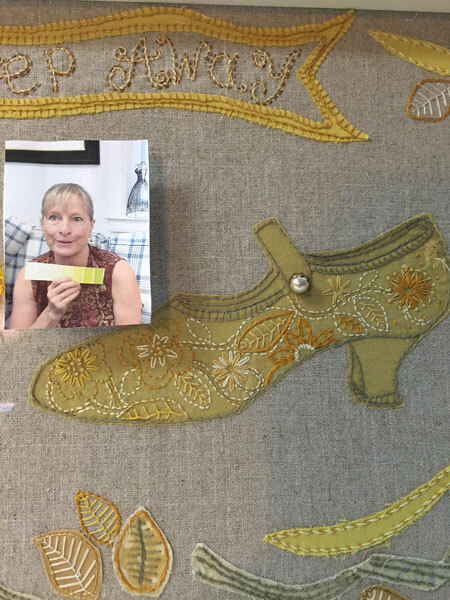 Maria created a work of art with this hand embroidered piece for her daughter. 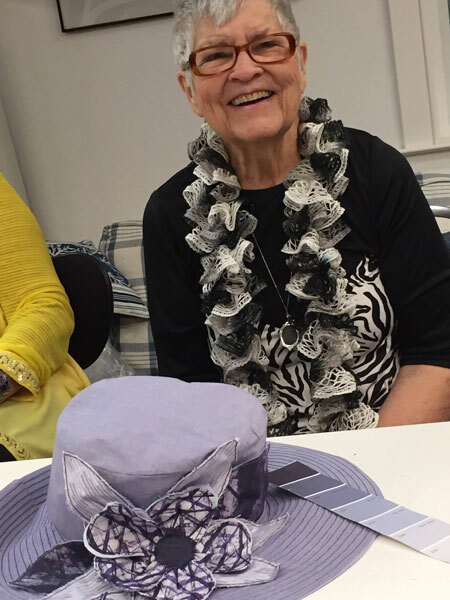 Sylvia created this beautiful hat and added a flower which she painted with the colors in her strip. 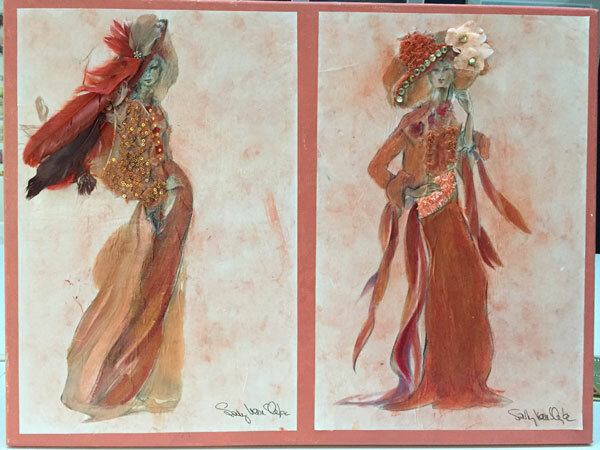 Sally painted two gorgeous ladies and embellished with feathers, fabric, and beads. Here are the stylish ladies. 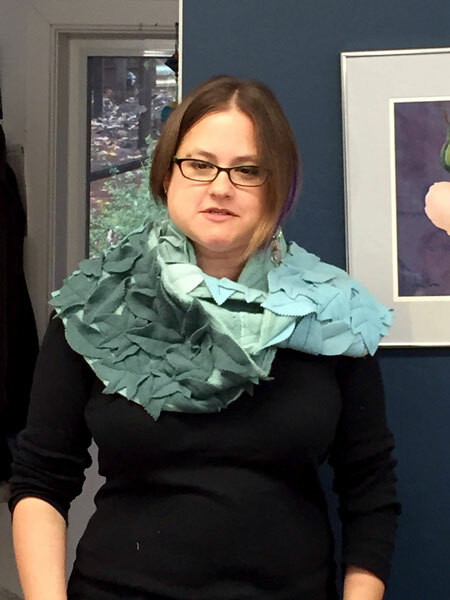 Carrie was adventurous and dyed used sweater knits to make this long scarf. 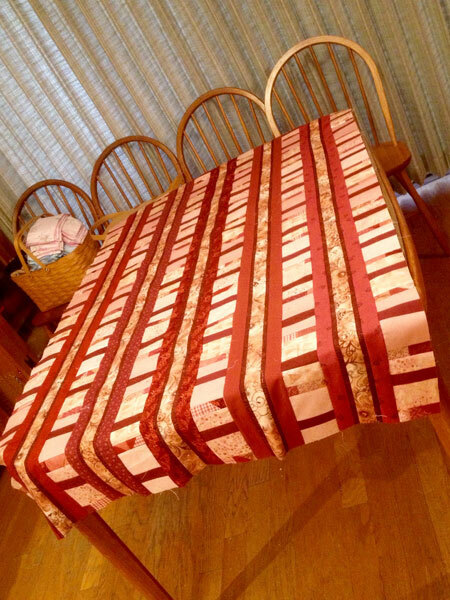 Barbara took fabrics from her stash to make this table runner and matching napkins. 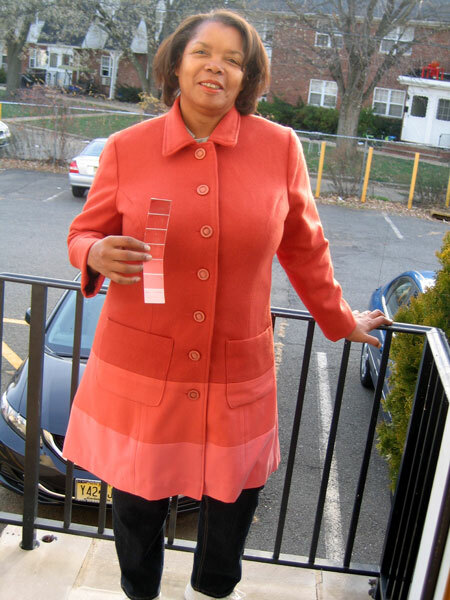 Sandra lives in New Jersey and did my challenge long distance. I sent her the paint strip and she created this amazing coat! 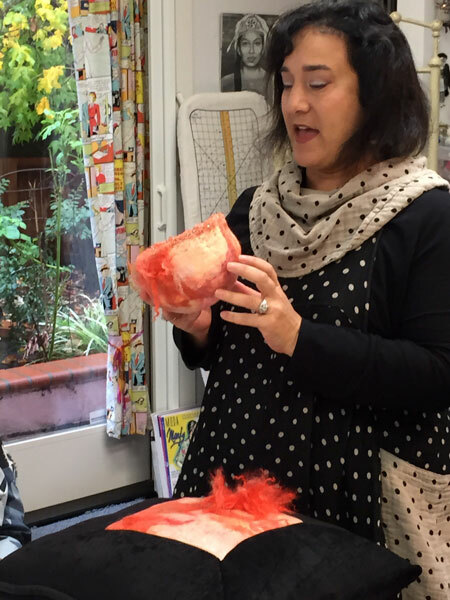 Joy felted a beautiful beaded bowl and a pillow for her daughter. 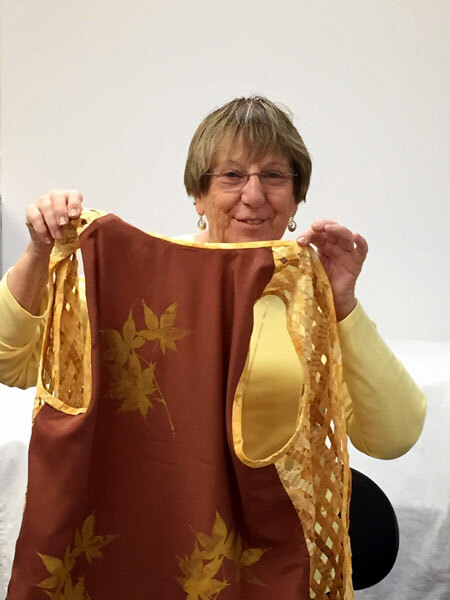 Helen bought cottons at Stone Mountain and daughter in Berkeley to make an apron for her project. 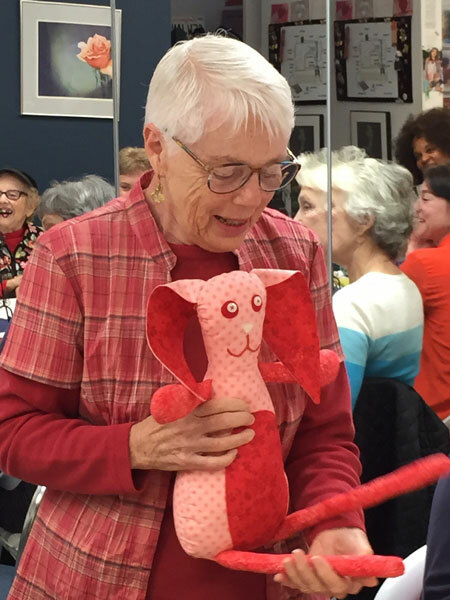 Frances made a fun toy for her granddaughter.She had not been to the studio before and drove all the way from Campbell. 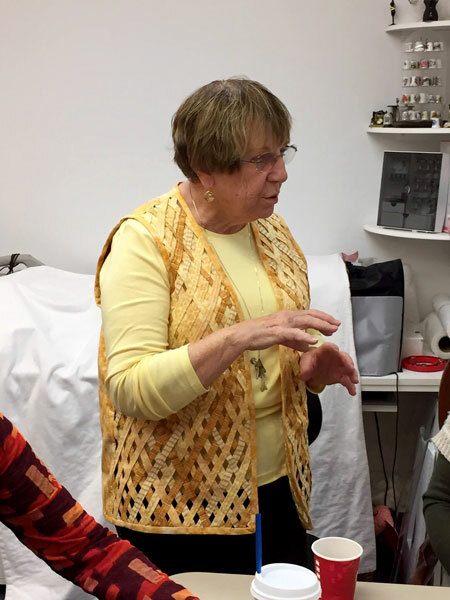 Cathy had this fabric in her stash and made this cute knit top. 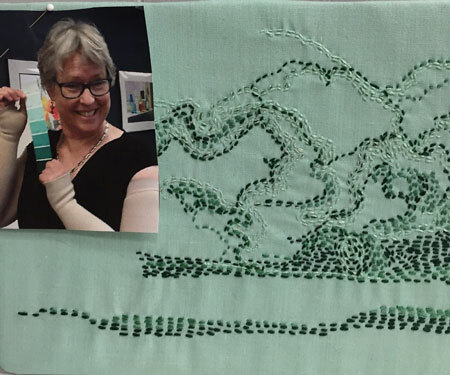 Vicki tried out some hand embroidery with one of her favorite subjects...Clouds. 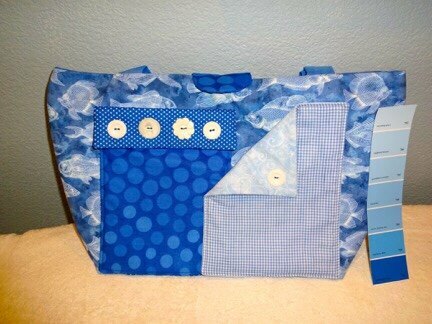 Susan made a tote bag with the colors in her strip. 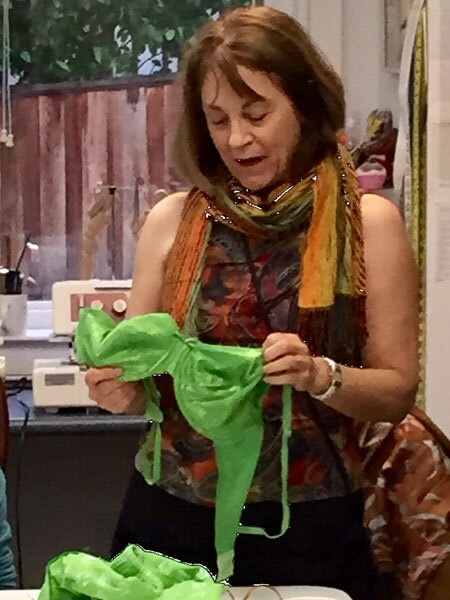 Jane had fun with fabric, glue and beads! 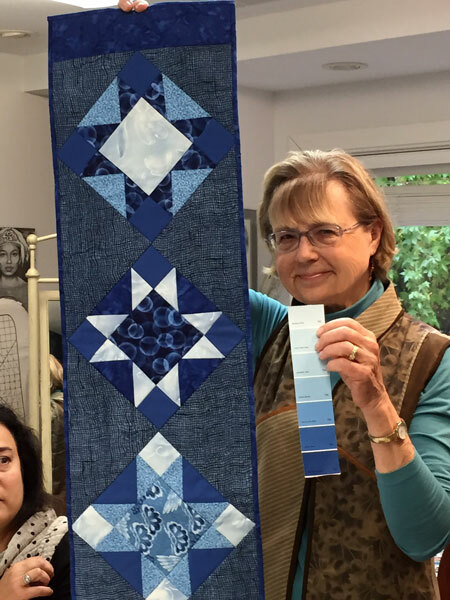 Laura matched the colors for this beautiful quilt with the colors from her paint strip. 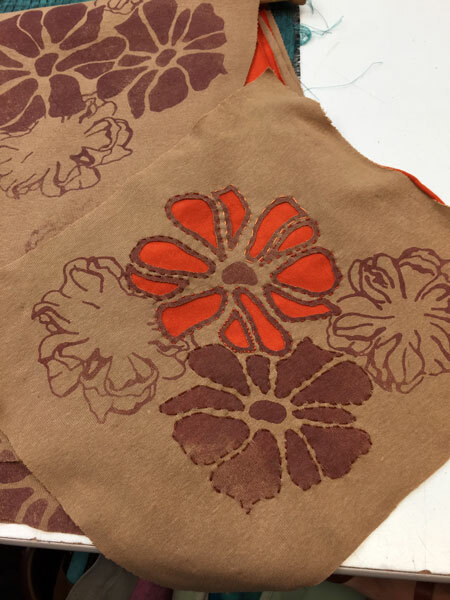 Vicki is making an Alabama Chanin style skirt which uses stencils and reverse applique. 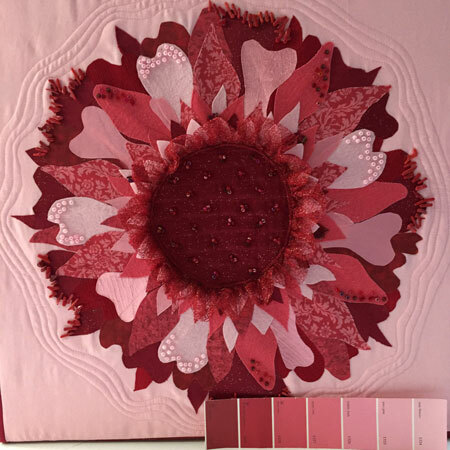 JoAnn used fabrics to make cards for the color challenge.